Saxo Bank’s Nick Nuyens took the biggest victory of his career on Sunday, winning the Tour of Flanders ahead of Quick Step’s Sylvain Chavanel and defending champion Fabian Cancellara (Leopard-Trek). 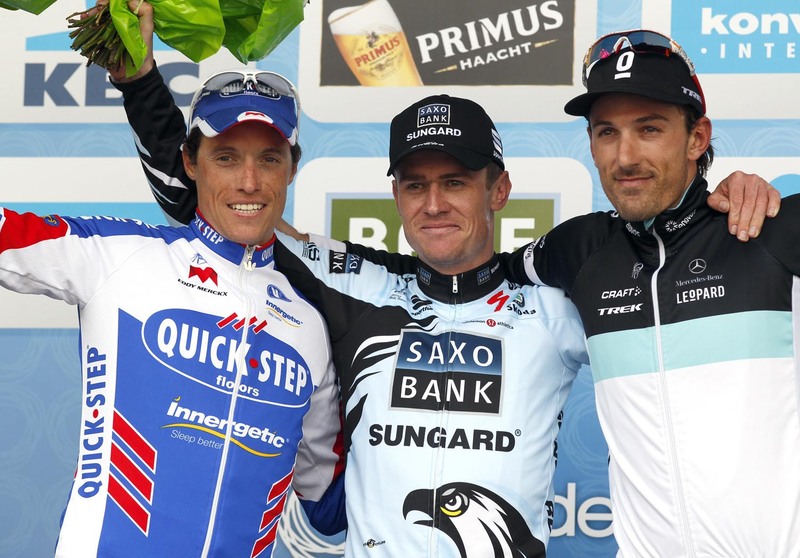 Belgium could celebrate a home victory, but whereas the majority of fans would have expected it to have come from Quick Step’s Tom Boonen or Philippe Gilbert (Omega Pharma-Lotto) – both of whom featured, and finished in the top 10 – it was Nuyens who outfoxed them all. British fans, meanwhile, could celebrate a top 10 finish from Sky’s Geraint Thomas, demonstrating a maturity that belied his 24 years. 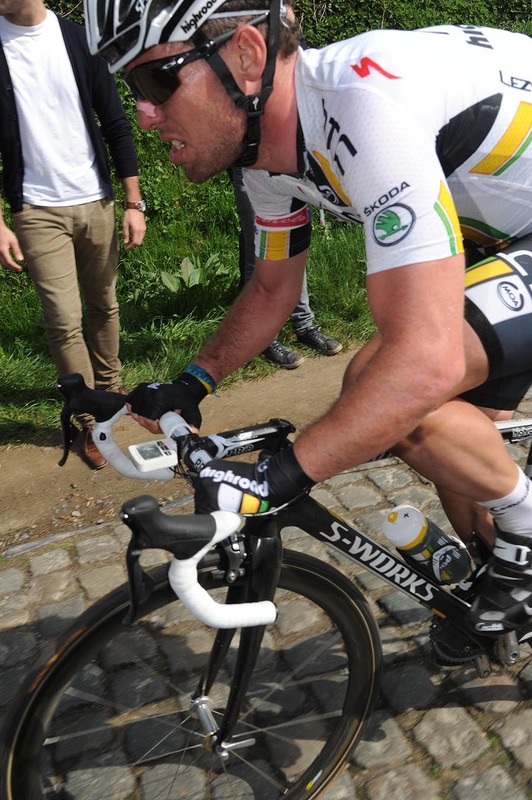 If he hadn’t had to work for team-mate Juan Antonio Flecha, he might have finished even higher in the results, and will certainly be one to watch in next Sunday’s Paris-Roubaix. Brits were also given the chance to cheer on two more of their kind early on after Sky’s Jeremy Hunt and Classics vet Roger Hammond (Garmin-Cervelo) got into the day’s big break, escaping as part of a five-man group after 50 kilometres. However, it was all over for Hunt with 84 of the day’s 258 kilometres to go, and Hammond succumbed soon afterwards as Chavanel swept past him, signalling the start of a long day at the head of affairs for the Frenchman. Inevitably, a blistering attack from Cancellara – immediately countering one from main rival Boonen on the Leberg with 40 kilometres to go – caused panic behind him, and at that point it already looked like it was game over. Had Cancellara really done it again so easily? 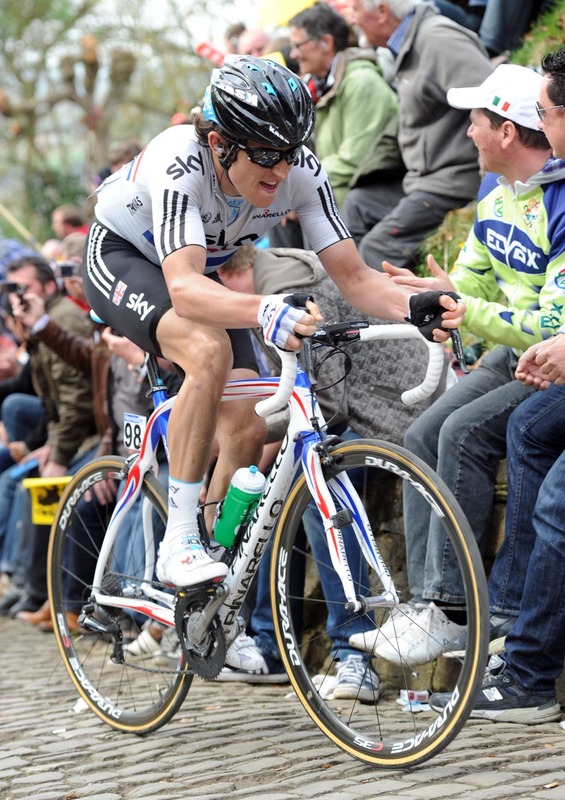 The Swiss quickly caught lone breakaway rider Chavanel going over the top of the Valkenberg, and the Frenchman had no choice but to accept an armchair ride on a flying Cancellara’s wheel. A gap of a minute with 30km to go, with Cancellara in time-trial mode, and disarray behind, made it look like there could only be one winner, but even Cancellara was capable of running out of steam, and the race came back together on top of the Muur van Geraardsbergen. The Muur – as it should be – was the defining moment of the race, serving as the place both where Cancellara and Chavanel were caught, and where favourites such as Boonen, Gilbert, Flecha and Alessandro Ballan (BMC), plus Nuyens, were able to get back into the game. A group of 12 riders looked as though they were going to dispute the race between them, with Britain’s Thomas having put in a fantastic ride to still be there at the end with his Sky team-mate Flecha, George Hincapie and Ballan for BMC and Boonen and Chavanel there for Quick Step. Those three teams with two riders looked to have the upper hand with only the Bosberg left to climb, but it was Gilbert who took a flyer off the front there with 12km left to race, where it looked like it was to be the end of Cancellara’s day. But as the race once again came back together with four kilometres to go, Cancellara somehow found the strength to attack once more, and this time only Nuyens and Chavanel could follow. Behind, the chasers could only look at each other, and under the kilometre-to-go banner, it was obvious that the front trio would stay away. Chavanel and Cancellara were clearly feeling the effects of their earlier efforts, and as Cancellara opened the sprint, Nuyens easily countered, with Chavanel unable to come past him on the line. See the April 7 edition of Cycling Weekly for additional coverage of the Tour of Flanders.